Two historic baseballs purported to have broken records as the “world’s fastest pitch” once withdrawn from a 2013 auction because of authenticity issues are now back on the market at Love of The Game Auctions in New Jersey. 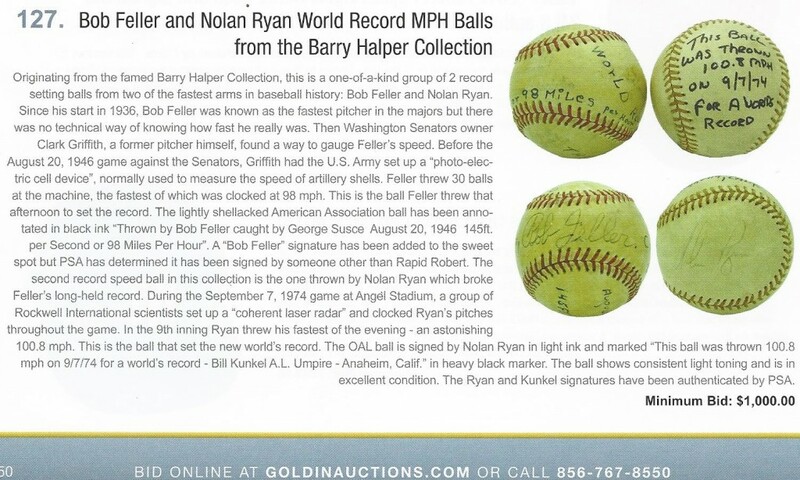 The auction house states that the balls alleged to have been thrown by Nolan Ryan and Bob Feller originated from the “noted collection of Barry Halper” and that the consignor purchased the pair for $4,312 in the 1999 Halper Collection auction at Sotheby’s. The auction house currently has four bids on the lot but makes no mention that the balls had previously appeared as lot 127 in Ken Goldin’s 2013 sale and that they had been withdrawn due to their dubious Halper provenance and questions raised by a 1974 wire photo that surfaced showing Ryan holding a different ball marked “100.8.” LOTG’s Al Crisafulli says his consignor didn’t tell him about the previous withdrawal from the Goldin auction. The alleged Ryan & Feller record "fast-balls" were removed from a Goldin Auctions sale in 2013 when their authenticity was questioned. The auction house also failed to mention in its original lot description that the Nolan Ryan ball, even if it were authentic, is identified as being pitched at 100.8 mph on September 7, 1974, when Ryan had actually established the record over two weeks earlier at 100.9 mph on August 20, 1974. In LOTG’s lengthy write-up about the history of the two events they linked to an article published on the website efastball.com but they failed to include the information that the record was broken on August 20th and that the Guinness World-Record was established on that same date, not on September 7th. 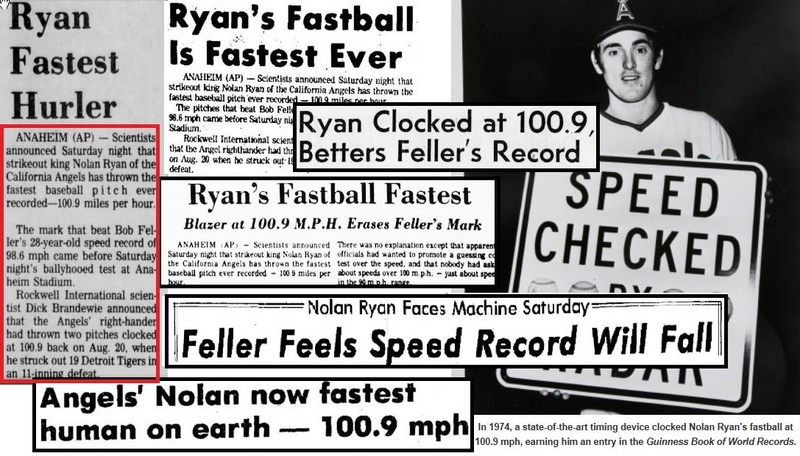 Barry Halper's alleged "fastest ball" says Ryan broke the world record on Sept. 7, 1974, while the Guinness book of World Records shows he broke the record on Aug. 20, 1974. The other offered baseball alleged to have been thrown by Bob Feller in 1946 at 98.6 mph has its own issues considering it features a forged Feller signature that Love of The Game describes as a “clubhouse” autograph signed on an Official American Association baseball. Feller established the record right before the start of a game against the Washington Senators and the likelihood he would have used a non-Major League ball from a league that included teams unaffiliated with Cleveland and Washington (and located hundreds of miles from Washington D.C. in the Midwest) is highly improbable. What’s even more improbable is that Bob Feller wouldn’t have signed his own record breaking baseball and that Barry Halper wouldn’t have had him sign the ball at some time after he had acquired it. Even Bob Feller’s son can’t see how the ball could have been positively authenticated without input from his late father. When the balls were first offered at Sotheby’s in 1999 Halper and his associate, auctioneer Rob Lifson, never divulged any additional information regarding the provenance for the balls besides the say-so of Halper who claimed that they were the authentic and original record-breaking orbs. Fifteen years after that $20 million plus landmark sale, the hobby is more well informed and aware of Halper and Lifson’s sales of over two million dollars worth of fakes and fraudulent items via Sotheby’s. In the 1999 Sotheby’s sale, Richard Russek and Andy Imperato of Grey Flannel authenticated hundreds of thousands of dollars of counterfeit uniforms and jerseys that Halper falsely claimed came from the collection of ex-Brooklyn Dodger Ollie O’Mara as well as others including Stan Musial’s rookie jersey and Mickey Mantle’s 1956 Yankee jersey. Other fakes included Lou Gehrig’s alleged “last glove“; Ty Cobb’s dentures and Halper’s famous “500 Home Run Club signed sheet,” which Halper falsely claimed was signed in person for him by both Babe Ruth and Jimmie Foxx. Halper's plaque honoring him and the "Halper Gallery" was removed from the Baseball Hall of Fame and Museum after reports revealed items he sold to MLB were bogus including Joe Jackson's 1919 jersey (center). Halper and current HOF Chairman Jane Forbes Clark cut the ribbon opening the now defunct Halper Gallery in 1999. Further destroying Halper’s credibility are another million dollars worth of bogus Joe Jackson and Mickey Mantle artifacts he sold MLB and the Baseball Hall of Fame in 1998. Halper lied and claimed that he acquired Mantle’s rookie jersey from Yankee clubhouse man Pete Sheehy and that he purchased Jackson’s 1919 jersey and “Black Betsy” bat from Jackson’s widow in the 1950s when he was attending the University of Miami and pitching for Jimmie Foxx. As it turns out, Halper never even played for the Miami nine and Foxx wasn’t even on the staff at the time he attended the school. The recently well documented exposures of Halper’s large-scale fraud even prompted the Baseball Hall of Fame to remove the Barry Halper Gallery from the Cooperstown museum. 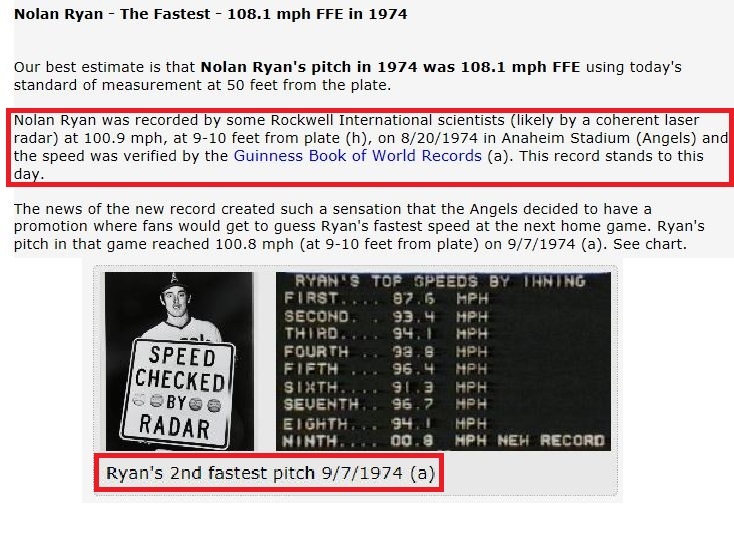 Nolan Ryan's world record pitch of 100.9 mph was reported prominently in the national and local press after it was announced before an Angels game on Sept. 7, 1974. The EFastball.com article that LOTG links in its lot description clearly states that the Ryan record was broken on August 20, 1974 and Ryan's top speeds per inning were posted on the stadium scoreboard at the end of the game when he failed to break his own record on Sept. 7, 1974. 2. The Halper Collection baseball was described at Sotheby’s as having been inscribed by AL umpire Bill Kunkel who worked the infield during that game. Kunkel allegedly identified the 100.8 MPH pitch as being a record breaking event, but having been on the field that day how could he make such a claim? It was announced in the stadium that 100.9 mph was the record and the Angels crowd was aware that Ryan failed to break his own record as the highest speeds were posted on the scoreboard at the end of each inning. It was also reported prominently after the game in local and national newspapers that the record of 100.9 was set weeks earlier and announced before the game played on September 7th. But more importantly, could a professional umpire working the infield have had the opportunity to retrieve the actual baseball thrown for the 100.8 mph pitch when the speed wasn’t reported until after the game was over? The actual 100.8 mph pitch was the third ball thrown to the lead-off hitter, Bee Bee Richard, in the ninth inning. According to accounts of that game, Richard walked and the following batter hit into a double play. The next batter, popped out to the catcher to end the game. A source familiar with MLB’s video archive told us that it was likely there was no surviving video from that Angels-White Sox game in 1974 to check for foul balls hit into the crowd. It is unlikely that the 100.8 mph ball survived the entire inning but, even if it did, could Kunkel have retrieved it from Ryan’s own catcher? Wouldn’t Ryan’s catcher keep the ball or give it to Ryan himself? Could Kunkel have even known to retrieve the 100.8 mph pitch when it wasn’t announced until after the game? On September 16, 1974 Sports Illustrated reported how “artifacts damaged by Ryan pitches (were) treasured like war souvenirs” by players. At the time, SI reported that Angels catcher Aurelio Rodriguez, wore “a twisted medallion that a Ryan fastball blasted after a mix up in signals” and that Umpire Jim Evans saved a “face mask disfigured by a deflected Ryan pitch.” While its clear that Ryan souvenirs were popular, its a logical question to ask why Bill Kunkel would have ended up with the 100.8 mph ball instead of Ryan? Barry Halper tricked Mickey Mantle into authenticating a bogus jersey he claimed was from his rookie season. Mantle inscribed a card and the jersey itself at Halper's direction (left). Could Ump Bill Kunkel's inaccurate inscription on the alleged Ryan ball have been coached by Halper as well? 3. It also appears that the JSA and SGC-authenticated inscription written by umpire Bill Kunkel was written at a later date than the Nolan Ryan signature which exhibits all of the characteristics of a signature originally signed on the ball in the 1970s. The Kunkel writing, executed in dark unfaded marker ink, appears to have been signed more recently. It has been established that Barry Halper often asked players and officials to inscribe artifacts and write LOA’s on index cards and it has also been established that he directed players to write inscriptions for totally bogus and fabricated material. The best example of this Halper practice was his directing Mickey Mantle to authenticate what Halper claimed was his 1951 Yankee rookie road jersey with the number “6.” Although Mantle inscribed and signed a card claiming it was his actual jersey from his rookie season, the jersey, which was purchased by MLB in 1998, was uncovered as a fake and later returned to Halper despite Mantle’s Halper-coached letter of authenticity. How can anyone say definitively that Halper didn’t orchestrate a similar scenario with Kunkel? It is very possible that Kunkel kept a game-ball from that night as a souvenir, but it is highly improbable that he would have been able to procure the actual 100.8 mph pitched ball. Nolan Ryan posed with actual game balls and "prop balls" throughout his record-breaking career. 4. Nolan Ryan was photographed on Sept. 7, 1974, holding a baseball marked “100.8″. Was that the actual baseball that broke the record? It’s clearly not the baseball offered by Halper or LOTG, but could it have also been a ball marked just for the photo opportunity? Throughout his career Ryan was photographed holding actual record-breaking balls or balls inscribed to represent the record-breaking event. But considering how the pitches were clocked and reported to the crowd only after each inning, could anyone on the field have even known which ball thrown by Ryan was actually the 100.8 mph ball? Why would anyone go to the lengths to retrieve the 100.8 mph pitch ball when it failed to break the pre-existing record? And wouldn’t Nolan Ryan be the most likely candidate to take home the “100.8″ ball if it actually existed? 5. 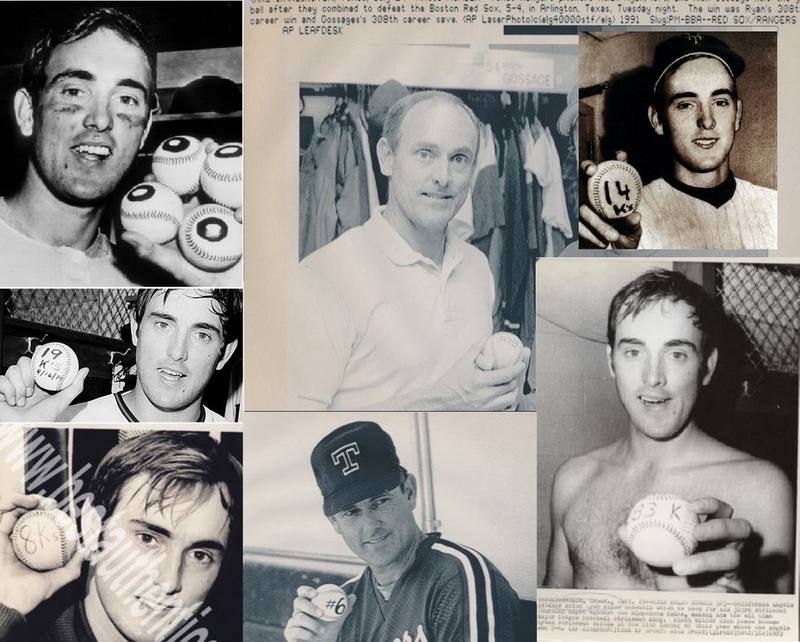 Nolan Ryan and his wife Ruth saved most all of the milestone baseballs from his MLB career and several are currently displayed by the Nolan Ryan Foundation at the Nolan Ryan Museum in Alvin, Texas. The displays do not include a ball that is identified as the one Ryan pitched when he established the Guinness World Record on August 20th or the one he pitched on September 7th. When presented with images of the Halper/LOTG baseball and the LOTG lot description, a representative from the Ryan Museum responded to the Hauls of Shame inquiry stating, “We are unable to authenticate the validity of this baseball.” Sources also indicate that Ryan never retained any souvenirs from the record-breaking “fastest pitch” events. Bob Feller established the record for fastest pitched ball in Washington D.C. in 1946. 1. Bob Feller’s alleged record-establishing baseball is an Official American Association ball that dates from the 1945 to 1947 era. This fact is the most problematic aspect regarding the authenticity of this ball since Bob Feller threw his 98.6 mph pitch at Griffith Stadium in Washington D.C. just before the start of an MLB game between the Cleveland Indians and the Washington Senators. The apparatus to measure Feller’s pitch was set up just before the game and the pitches were clocked during Feller’s warm-up for the game that day. Neither the Senators or the Indians had any affiliation with or any minor league clubs in the American Association. In fact, the teams in the American Association were located in the midwest from Columbus, Ohio all the way west to Kansas City. 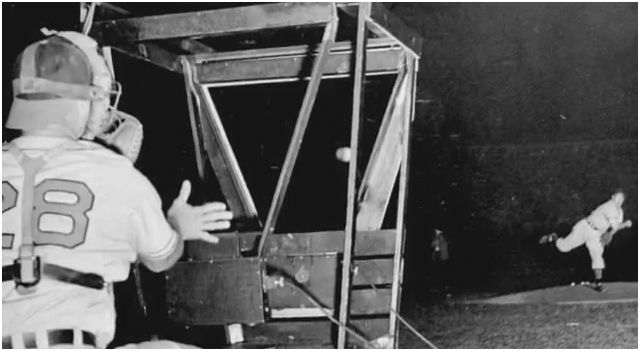 Why would an MLB pitcher like Feller have used an American Association ball in a promotion organized by Clark Griffith and the Senator organization in an MLB ballpark, just before an MLB game and during his warm up for that very game? 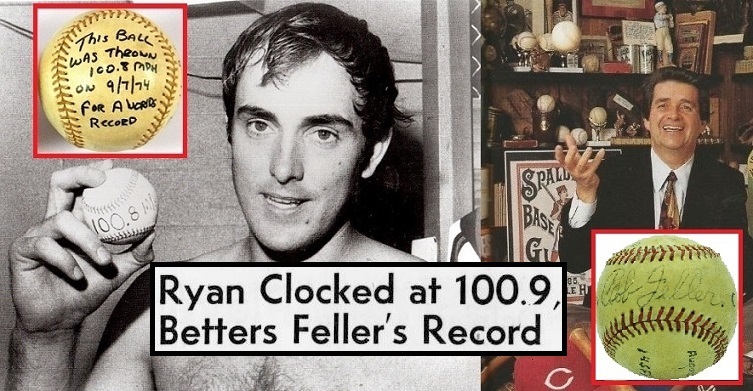 Halper's alleged Feller ball is an official American Association ball but Feller set his record in an MLB ballpark while he was warming up for a game against the Senators. Neither the Indians or the Senators had minor league clubs in the AA and the teams in that league were all located hundreds of miles away from the Washington D.C. ballpark. The non-genuine Feller signature on the alleged record baseball (top left) is called a "clubhouse" signature by LOTG Auctions. The signature has more in common with Feller's post-2000 autograph (bottom, left) than it does with an authentic example dated in 1945 (right). 3. Barry Halper’s index cards and letters of authenticity from players regarding game used items in his collection were scattered all throughout the Halper sale at Sotheby’s in 1999 and many other Bob Feller items were accompanied with a supporting statement from Bob Feller describing the provenance of the artifact including: Lot 1102- “The Bob Feller Family Catcher’s Mitt” which came with a signed card reading: ”This is the mitt my father used to catch me when I was a kid….It was this mitt he was using when I threw a fastball in 1934 that hit him in the chest and broke three ribs-as described in TIME Magazine April 19, 1937–Bob Feller”; Lot 1395- a plaster cast of Feller’s hand inscribed, “To Barry from Bob Feller”; Lot 1396- a signed scorecard inscribed, “To Barry Halper, Best to a great pal, Bob Feller”; Lot 1468- Feller’s 1940 Double-Knit Cleveland uniform which was accompanied by a letter from Feller stating: ”To Barry, To my knowledge, this is the first double knit baseball uniform ever made and was sent to me for testing a few years before World War II….”; and Lot 1469- Feller’s “Late 1940’s Indians Warm-Up Jacket” which came with a a letter of authenticity on an index card executed by Feller. Ken Goldin (left) withdrew the suspect Ryan-Feller balls from his sale in 2013 but LOTG's Al Crisafulli (center) doesn't reveal that to his bidders in the addendum to the #1 lot in his current auction (right). It should also be noted that Goldin has not responded to several Hauls of Shame inquiries regarding the misrepresented 1960 Ted Williams glove he sold in his last auction and allegations leveled by several sources who contacted Hauls of Shame accusing his consignor, Dr. David Pressman, of having a history of selling bogus Ted Williams items. Kind of ironic that Bob Feller talks about how bad the memorabilia business is, when his constant traveling companion was a distributor of forged autographs for many years. Crisafulli is crisafulli of crap if he believes that major league teams would have ordered unofficial balls for practice, even in the 1940’s. Absolutely didn’t happen, particularly in Washington. The Baxter brothers (Frank, then Fred) were the equipment guys from the 1920’s until the team moved to Texas in 1971. Having interviewed Fred at some length I can say without equivocation that only official AL baseballs were used at Griffith Stadium and later at DC/RFK Stadium. I got to hand it to Crisafulli. He’s got a lot of balls. This crisafulli is so clueless he doesn’t even throw in the “leap of faith” language and the “this may be the ball” lingo to cover himself like the other auction crooks. The dubious Feller and Ryan balls are still up for sale in the LOTG auction which ends tonight. The bid is still at $1,300. The Feller and Ryan balls never got another bid and sold for $1,300. The Bob feller autographed baseball I have in my personal collection is genuine, proof being it’s authenticated by Christopher Morales. And no, it is NOT for sale so please don’t ask!